BERLIN - Democratic Incumbent House Speaker Joe Aresimowicz says he has won re-election over Republican Mike Gagliardi in the 30th District, but the margin of victory - just 37 votes - was slim enough to trigger a recount. Aresimowicz also said he would be filing a complaint with the State Elections Enforcement Commission, alleging illegal coordination and undocumented independent expenditures in Gagliardi’s campaign. He also called for the resignation of Berlin Republican Town Committee Chairman Anne Reilly. Aresimowicz received 5,892 votes to Gagliardi’s 5,855, according to numbers from the Secretary of the State’s Office. The district encompasses most of Berlin, which delivered a majority of its votes, 3,712, to Aresimowicz, and parts of Southington, which favored Gagliardi, giving the challenger 2,437 votes. The total margin of victory was 37 votes, which falls within guidelines - a 0.5 percent difference or less than 20 votes - to trigger an automatic recount, according to the state’s Secretary of the State’s office. “You’re not going to see 38 votes swing in a recount. … You’ll see three or four,” said Aresimowicz Tuesday night when he decided to claim victory. His call came hours after polls closed after waiting for final results to come in from Southington’s Election Day registrations and absentee ballots. “It’s an automatic recount. That’s the rules. We’re going to follow the rules,” said Reilly Tuesday night. “We’re pleased with the votes we got. I’ll have further comment after the recount,” said Gagliardi. 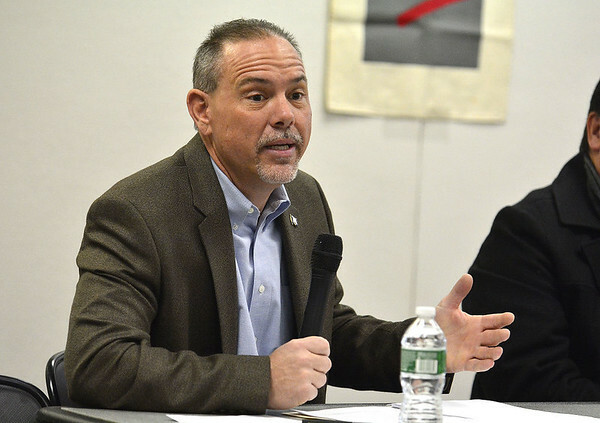 “The reality is this race is a lot closer than it should have been, in part because of some illegal activities that happened in the waning days,” Aresimowicz told Berlin Democrats Tuesday night. According to Aresimowicz, signs that were put up at polling places were reproduced in ads placed in the Berlin Citizen, a weekly newspaper, by a “concerned citizen.” The signs and ads had the same images used by the Republican Town Committee, he said. Aresimowicz said the possibility that the Gagliardi campaign coordinated placement of the ads “under the auspices of a concerned citizen,” with the cost of the ads exceeding expenditure limits, was reason for a complaint. Aresimowicz said, “This was the dirtiest campaign,” alleging that the Republicans had lied in mailers and on “robocalls” to voters, and that Reilly should resign. Reilly doesn’t represent Berlin Republicans, Aresimowicz said, adding that he’ll be talking with them over the next two years about what their party should look like. The signs Aresimowicz referred to were not Berlin RTC signs, she said Tuesday night. Members of the Berlin RTC said Aresimowicz himself ran a dirty campaign by putting up signs that called the Republicans’ original candidate, Steven Baleshiski, a racist, a radical and a bigot. Baleshiski, of Southington, withdrew from the race in early October, losing his party’s nomination after past Facebook posts received criticism. According to a declaratory ruling from the SEEC, a violation as alleged by Aresimowicz can result in civil and criminal sanctions, depending on the facts for the case. Independent expenditures that don’t exceed $1,000 don’t need to be registered with the state. Posted in New Britain Herald, Berlin, Southington Herald, State on Wednesday, 7 November 2018 21:05. Updated: Thursday, 8 November 2018 10:37.